Part of Missouri Rock Island Trail work progresses toward expected completion this year through southern Johnson County. “This state park is being developed … between Pleasant Hill and Windsor,” Missouri Rock Island Trail Inc. Director Greg Harris told Warrensburg Rotary Club members. The complete Rock Island corridor stretches from a point near St. Louis west to Kansas City – a total distance of 144 miles, he said. “The first 47 miles opens this year,” Harris said. Gov. Jay Nixon, an outdoors advocate, announced Sept. 17 that the 47.5-mile stretch of the Rock Island Trail would adjoin with the 240-mile Katy Trail, marking the country’s longest rail-to-trail conversion. MoBikeFed comment: This is the section of the Rock Island Trail that first came under discussion as part of the settlement for the Taum Sauk disaster in 2007. The 47-mile section will be the first complete part of Rock Island Trail State Park and will connect the Katy Trail with Pleasant Hill, on the outskirts of the Kansas City metro area. Work to complete this section of the trail has been underway since Ameren signed the Taum Sauk settlement in late 2007. 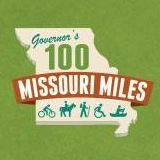 Governor Nixon has pledged to have this 47 mile segment open by the end of the year--Dec 31st, 2016.